Everyone knows that Prince Edward Island is famous for Anne of Green Gables and potatoes. What people may not know is that we are also the leading oyster producing province in Canada with 6 million pounds being shipped worldwide annually. Mother Nature has gifted us with an area of outstanding natural beauty and ideal conditions to grow the popular Crassostrea Virginica oyster - also known as the “American” oyster - a veritable food treasure enjoyed by millions worldwide. Our company is based in Salutation Cove, in the community of Fernwood, on the south shore of Prince Edward Island. We have been cultivating some of the best oysters in the Atlantic Region, thanks to the ideal conditions of Salutation Cove, a sheltered, clean, protected sanctuary. The shoreline of the cove is a truly magnificent unspoiled piece of nature that has escaped the development seen in many other oyster growing areas. In fact, our only neighbours are a few shorebirds and the occasional heron looking for dinner. The vast majority of this shoreline is bound to remain unchanged for years to come thanks to the Island Nature Trust which owns a vast part of the lands surrounding our oyster beds. There is nothing in the world Brian would rather be doing than enjoying the solitude of quiet sunrises on the Cove, tending the oyster beds. Brian is married to Christine and they have 3 children, Darcy, Samantha and Ryan. 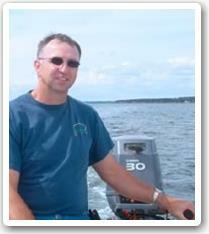 Brian’s favourite pastimes are enjoying cruising the PEI waterways on his yatch. Ensuring the highest standards are met for oysters coming through the plant keeps Erskine quite busy. Overseeing and being responsible for all the oyster stock is a job he enjoys. 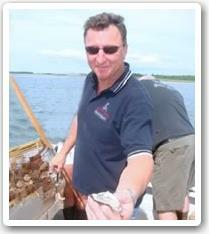 Having been involved in the fishing industry all his adult life, he decided to become a full time oyster fisherman in 1988 and he brings a wealth of experience to the team.